TUCSON, AZ – The Tucson Roadrunners, proud American Hockey League affiliate of the Arizona Coyotes, are set to celebrate the Thanksgiving Eve holiday with a night of cheap food and fun at Tucson Arena next Wednesday. 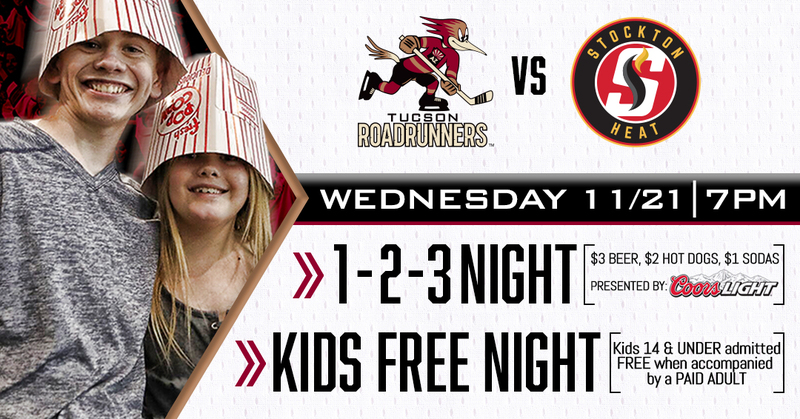 With the purchase of a paid adult ticket, all children 14 and under will gain free admittance to the Roadrunners game. The offer can be redeemed at the Tucson Convention Center box office. Once in the arena, it’s a “1-2-3 Night” presented by Coors Light, featuring $3 Beers, $2 Hot Dogs and $1 Soft Drinks. For more information on both promotions, call the Roadrunners at 866-774-6253 or visit the team’s offices at 175 W. Broadway Blvd. in Tucson.